FAO and ICT-KM are not only joining forces on the next edition of the KS Workshop. We are also working together to improve, and expand the KS Toolkit. 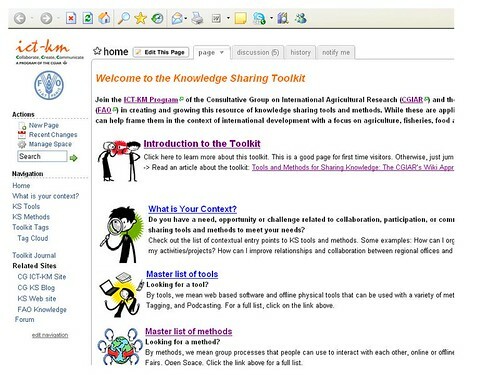 That is why the Toolkit is now accessible through a new URL: www.kstoolkit.org (the former one is redirected) and why you can see the FAO and ICT-KM logo since the homepage. Look further into collaboration with the authors of other toolkits. We are currently in the brainstorm mode and any comments, priorities, additions to the above list would be welcome. Nancy White is an amazing woman. Nancy helped us to set up the KS toolkit, and also “her job is done”, we benefit from her continuous input and energy to move projects forward that are close to her passion. Have a look at the KS toolkit. It has now a new section with links to glossaries that can help to find our way through the KM terminology jungle. Nancy says: “There are a lot of technical terms related to tools and method. What makes sense to one person, is jargon for another. Instead of creating (or recreating) a new glossary, we decided to link to some other good existing glossaries. If you know of a good glossary, please add the link! Petr is the Knowledge Sharing and Capacity Building Coordinator at CIMMYT (Mexico). He has a background in biological sciences and education. His responsibilities include course design and development, facilitation of knowledge-sharing processes (both inside and outside institutions), and “soft skills” development. Petr is responsible for the knowledge management components of several CIMMYT projects. He also coordinates the Cereal Systems Knowledge project of the IRRI–CIMMYT Alliance. Nancy works with organizations to strengthen collaboration and communication online and offline. She has a special interest in online facilitation, teams and communities of practice, and whole systems change. She is currently writing a book on technologies in support of communities and learning graphic facilitation and deepening her love of chocolate from her home base in Seattle, USA. Lucie is an information professional with 8 years’ experience in knowledge management within the field of international development. Her main focus is capacity or skills development, specifically, knowledge-sharing approaches and online networking. She also regularly designs and facilitates face-to-face meetings. Simone is leader of the Institutional Knowledge Sharing Project. She is a trained social communicator with 13 years’ experience in the coordination of electronic communications projects. Her interest lies in the enhancement of collaboration in institutional settings that contribute to organizational learning and change. Simone is based at CIAT, Colombia. Nadia is a researcher and outreach coordinator at IWMI and project leader of the Knowledge Sharing in Research project (sister component to the IKS Project). With a background in anthropology, and development and environmental studies, she seeks to understand, develop, and promote ways in which people can work together to understand, decide on, and solve problems associated with natural resources. The one-day workshop on Web-based collaboration was co-sponsored by the Institutional Knowledge Sharing Project and CIAT. The 32 Participants also contributed with a small inscription fee. It was a successful joined effort and we were lucky to be able to catch Nancy on her trip to Colombia where she will also work with the Ministry of Education. After a chat-show introduction, the agenda followed with a Tag-game, a purpose checklist exercise, and a session on Web 2.0 tools. Participants felt that the workshop was useful to get basic knowledge on the available tools; they also appreciated the exercises on the 3-step process that Nancy recommends while planning on-line events: Check the purpose, plan the different activities, choose the appropriate tools! Finally, many participants would like to receive further training on specific tools, like wikis, and blogs. I love Nancy’s style and appreciate so much her knowledge on principles and methods of Web-based collaboration. This is definitively an area to explore with our CG colleagues around the globe.